So then I thought, “What would I give Jane Austen for her birthday?” Well, what wouldn’t I give her? But I am just a poor blogger, and have just set up my own carriage, and after all Jane wouldn’t approve of unwonted extravagance, would she? Of course not. So applying my Janeite thinking cap, and using my skills and existing yarn stash, I would crochet her some fingerless mitts out of soft, warm (but washable!) wool to help keep off the chill in those non-central-heated houses. She can wear them and still write, but the mitts would, one hopes, stave off the arthritic chill and the repetitive stress issues for a bit. Definitely superwash wool, so that the ink can be rinsed out. I wouldn’t give Jane fame, as she didn’t want it; but I would give her a long life and career as what would today be called a midlist author, quietly producing a new book every eighteen months or so–rather as some women in her day produced babies–to be rapturously received by her wide, quiet, cultish readership. Her backlist would continue to be reprinted and keep selling, year after year, and she might collect a weirdo stalker fan or two *cough*, but in general she would be left alone in Hampshire to write and make lots and lots of money from it. That’s what I would give her. And, you know, the mitts. Gentle Readers, what would you give Jane Austen for her birthday? I believe that my present would be to let her know, in one way or another (I know not precisely how), what her novels have meant and still mean to generations of women (and surely a few gentlemen). I like to think that it would not leave her unmoved. I would give her inspiration for a new novel. With my family, I don’t think it would be too hard! I would offer her a sponge-cake to celebrate the day, since the purchase of one was always so “interesting” to her! I would tell her how loved and admired she is 235 years after. Worldwide. Thanks for celebrating!! Grate idea! I agree with most of the others here–I’d just like to sit her down and tell her how much of an impact her works have had on me and so many others. I learned something from each heroine, and I’ve spent so many hours curled up in bed just reading and imagining. I was 16 when I found her and I’m still in love now that I’m nearly 20! I’m sure that I’ll be passing on the books to any children of mine and I hope that would make Jane happy, considering how she shared her stories with her family. I would like to give her a book that made her and Cassaundra laugh. Happy Birthday Jane! I would love to give her plenty of paper so she wouldn’t have to cross her letters, and write more and more. I want to shield her from the likes of K Sutherland. As a fellow knitter, I applaud your choice of gifts! Do you have any extra yarn so I can knit Jane a matching cap? 😉 Most of all, on her birthday, if propriety would allow, I would give Jane a hug! I’d give her a copy of JA’s Fight Club and I think she’d love it! If we could give her health and long life – think of all the additional books she might have given back to us! Happy birthday, dear Jane. I would give her an annuity, for her health. People always live forever when there is an annuity to be paid them. Great one, S.! You and Reeba beat me with the presents. So may be I would have then added the ink, quills and invent pre-paid postal service for her. Hand crocheted mits? Don’t think I could top that. But I would send her some port wine to also stave off the chill, and a glorious new bonnet. She loved fashion, and a new bonnet might make her smile. After curing whatever took her from the world so tragically soon, I would send her on a Grand Tour. I second Maria L.’s idea of sending her to the sea-side for a month, but why stop there? She never even got to go the Lake District, Scotland or the Hebrides. I would love to see what kind of ideas she would come back with after a couple of years touring the Continent, visiting the locations that inspired her favorite horrid novels. And then, yes, to see her come back to Hampshire and live quietly another 30 or 40 years, producing delightful novels with clocklike regularity. Happy Birthday, dear Miss Jane Austen; you are alive in our hearts. I’d give her happy thoughts and lots of shelves in the closet. I would invite Jane and Cassandra to see P &P 95 to see what they would think of David Bamber’s portrayal of Mr. Collins! They might like to try popcorn while we watched it- unless it already had reached the Old World by Jane Austen’s time. Happy Birthday to our dear Miss Jane…I’d gift her a new hat and trim with bathing suit and parasol for the bathing resort visit. Belated birthday wishes and present for JA: I would invite her to come to Australia. Of course from the holiday, I hope she will write an intercultural romance. It will be fun to see how she takes on cultural differences. 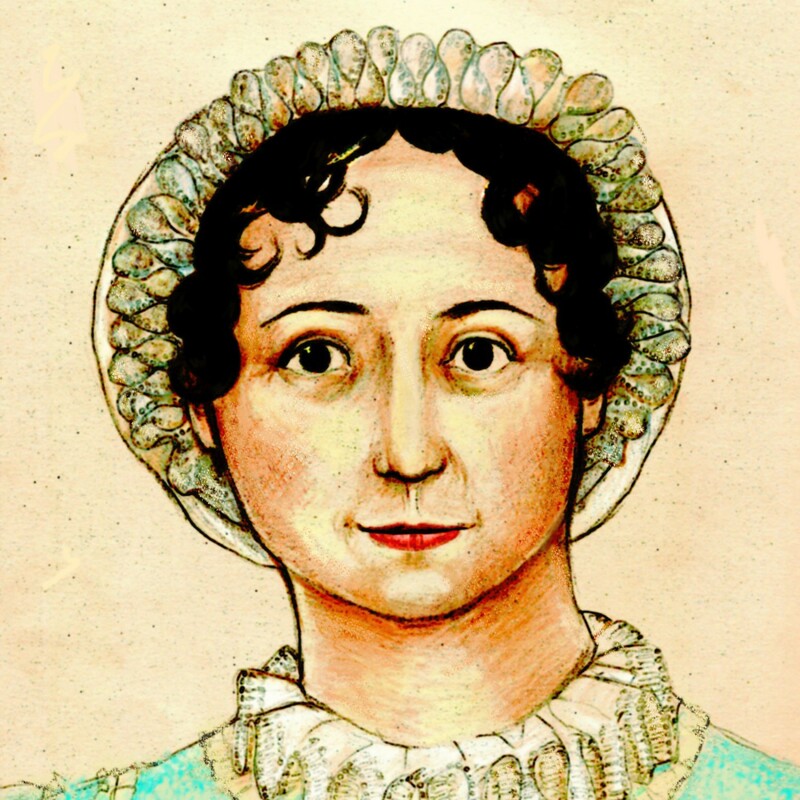 I would love to arrange a supernatural window from heaven for Miss Austen to peer through into our time so she can realize and appreciate the impact of her legacy on future generations. Even if I am late, happy birthday Jane!! 🙂 Thanks for all those beautiful and intelligent stories!! Me again. Drop by to wish all of you a Merry Christmas and Happy New Year. Thanks for all the great posts that keep me entertained, informed and laughing throughout this year. May 2011 bring you ladies many happy returns, memories and love.